I’d never been to the Kelso Dunes. I found photographs of them online that looked reasonably promising, but when we got there on Tuesday I realized that the dunes were mostly covered in vegetation. Not what I had in mind. With time I might have been able to find a nice, vegetation-free dune to serve as my foreground, but we didn’t have much time, so we decided to head north to Death Valley, a place I know well, and take our chances with the clouds. Tuesday morning the forecast for Death Valley had seemed promising enough, predicting 5% cloud cover for the eclipse early Wednesday morning. But by Tuesday afternoon the forecast had changed, with the cloud-cover prediction increasing to 25% during the eclipse. Rats. And sure enough, we saw lots of high clouds streaming through that afternoon. But at that point it was too late to go somewhere else, so we grabbed a campsite and hiked out to the dunes late in the afternoon. We ended up staying out under the moonlight, looking for the right dune to put in the foreground. I found a couple of possibilities, but nothing I was terribly excited about. We went back to our campsite, ate dinner, and I caught a couple hours of sleep. At midnight I headed out to the dunes again, with enough time to do some further scouting in the moonlight. I tried a different area, and eventually found one dune with a beautiful S-curve leading in the direction of the eclipse. That would do nicely. I put on my 20mm lens, set up my tripod, and used the PhotoPills augmented-reality feature on my phone to estimate the path the moon would take. I made sure the tripod legs were firmly planted in the sand, and framed a vertical composition, taking into account the estimated path of the moon and putting the dune at the bottom of the picture. By then the moon was right at the upper edge of the frame, so I started capturing my sequence almost immediately. I continued making exposures of the moon every ten minutes as it went from full, to partially eclipsed, to fully eclipsed, and started to emerge from totality. During the total eclipse I also made some exposures for the stars and dunes, thinking I might use those frames as the background for my sequence. I also made more exposures for the overall scene as the dawn turned the sky blue, cast a faint pink glow on the clouds, and started to illuminate the dunes. That 25% cloud-cover prediction proved accurate, but despite all the high clouds the moon remained visible throughout the entire eclipse sequence. There was only one brief period near dawn when the moon was almost obscured by clouds; that’s why the third moon from the bottom in this sequence looks a bit fuzzy. But all in all I got pretty lucky with the clouds. It started out as a bright, moonlit night, but as the earth’s shadow eclipsed more and more of the moon it got darker and darker. During the total eclipse the sky was full of stars, just like a moonless night – except that there was this dim, glowing, reddish moon hanging in the sky to the west. It was quite striking, and a little eerie. It wasn’t quite as dramatic as watching the solar eclipse last summer, but it was a very cool experience. When assembling the sequence later in Photoshop I decided to use one of the dawn exposures as my background. I blended that with an earlier image of the stars, and with the moon exposures made ten minutes apart. 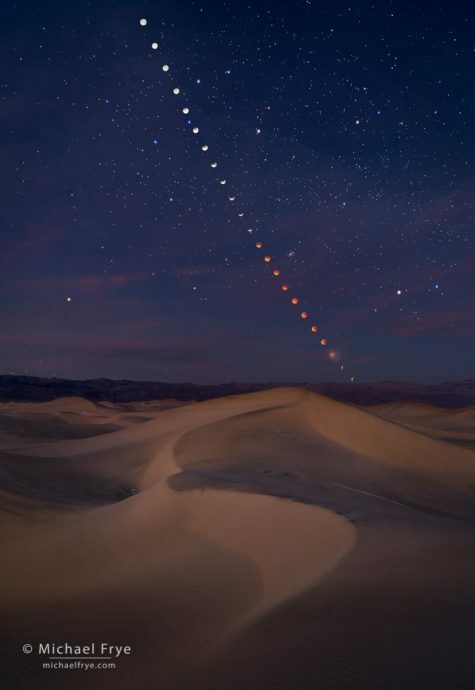 The resulting photograph is, of course, a composite, representing a period of time between 2:50 and 6:30 a.m. as the moon moved through the sky and became eclipsed, the sky got darker, the stars came out, and then the dawn started to illuminate the scene. Although it’s a composite, I didn’t move the camera or change lenses during the whole sequence, so the moon positions are realistic. I’ve seen many outstanding photographs of this lunar eclipse, so it seems that a lot of people got out to view and photograph it. I hope they all enjoyed it as much as I did. I made sure to take time between exposures to appreciate being out in the beautiful, quiet, mysterious dunes under an eclipsed moon. The best laid plans… Sorry that didn’t work out for you. Great image and it’s always good to read about the story behind the image. Unfortunately, here in Texas the totality occurred when the sun was rising, so there wasn’t too much contrast on the sky. Even though it wasn’t really photogenic, it was beautiful. Thanks Gabor, and I’m glad you enjoyed the eclipse. Really nice photograph Michael. I, too, photograph the Lunar Eclipse with a telephoto lens, and I capture some keepers here in Morgan Hill. However, I did not have the opportunity to stay from start to finish because I had to go to work that morning. Thanks for the input you gave us before the eclipse. I appreciate the knowledge you share with all of us. Thanks Martin. I hope your eclipse photos turned out well. Beautiful photograph, and an other fantastic story to back it up. Thank you to let us participate. I really enjoyed this story and the image. Can’t to see you process this one. Great story! How you manage to make this shot is mind-blowing. I would probably fail to make this kind of shot. But I really enjoyed this story. Glad you enjoyed it Randy! Amazing composite and location! Thanks for the background story! Beautiful image Michael. I always enjoy reading how you “got the shot”. I captured a similar sequence at Joshua Tree with which I am pleased. It worked out for me in large part due to your helpful instructions published here previously. Thanks Hadley, and I’m glad your sequence at Joshua Tree turned out well! The image speaks for itself… outstanding. I gotta say though, I learn more and have a deeper understanding of it all from the backstory. Thanks for the image, the inspiration and putting it out there for us. It’s a big part of your legacy Michael. I hope tto cross paths someday. Beautiful photograph! Your background story makes it all the more remarkable. Thanks for sharing. Unfortunately, fog here in the San Joaquin Valley. Thanks Tom. I use the Rokinon 20mm for most of my night photography. However, I had to test four copies before finding a good one, so I hesitate to recommend this lens. Nice image Michael! We were there in Death Valley for the eclipse also. Went to Zabriskie Point. It was crowded and windy. I think you picked the better spot. Thanks Dave. I thought about Zabriskie Point. I figured it would be crowded, but certainly a nice view. Interestingly, there was no wind in the dunes. I so enjoy your photography and writing. As the moon was setting I got to watch a foal being born. We named him “Mr Blue. That sounds wonderful – thanks!